In response to the overwhelming need for affordable housing in upstate South Carolina, ATCEDC provides affordable rental opportunities for families at or below 50 to 60% of the area median income. All properties are single family homes, meet Energy Star Standards, and are constructed by professional builders. All homes are equipped with HVAC and full appliances. 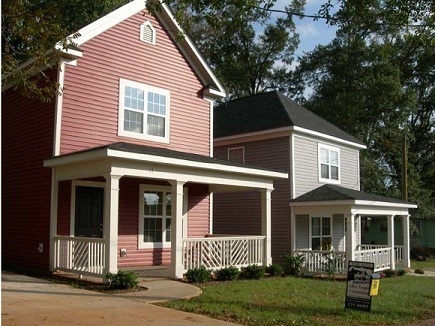 Since its founding in 2005, ATCEDC has completed 11 projects in Greenville, consisting of 61 homes across the Sterling, Southernside, Judson, Pleasant Valley, West Greenville and Green Avenue neighborhoods. We also have completed two projects in Pickens resulting in a one-of-its-kind development of 4 affordable rental houses in Pickens, South Carolina. Allen Temple CEDC will complete three Greenville projects this summer adding another 8 homes to the program. ATCEDC houses in the Sterling neighborhood. A typical ATCEDC single-family unit. One of our goals at ATCEDC is to develop our affordable rental product in such a way that no casual bystander would immediately identify our houses as “rental property." Quality landscaping helps us accomplish this goal! Randolph Commons in the Southernside neighborhood is a six unit affordable rental pocket community. Constructed in a cluster and using innovative new urban design principles, the development makes maximum use of a neglected 7/10 acre former trash dump. Two of the ATCEDC houses that make up the first affordable rental development in Pickens. Completed March 2012.